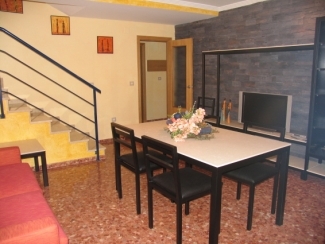 An attractive duplex in the town of Rafelbunyol, 18 km from Valencia. The building is near the centre of the town. 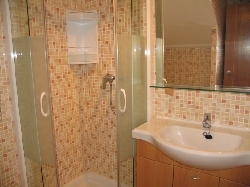 It is a two bedroom duplex, located on the first floor of a recently constructed building, with a lift. On the first floor there is a sitting-dining room, kitchen and utility room, a bathroom with shower, and the main bedroom with a king-sized double bed. 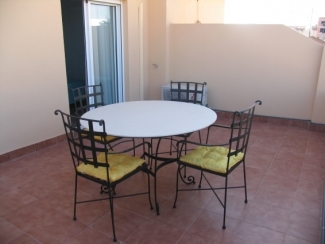 On the second floor there is another double bedroom with access to the balcony, and a fully equipped bathroom. 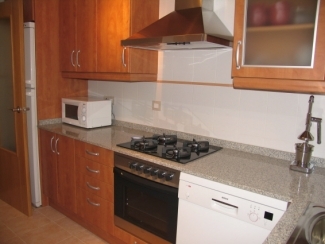 This flat is very well appointed, the electrical appliances are new and of the best makes. The furniture is also new, and the flat is decorated in good taste. 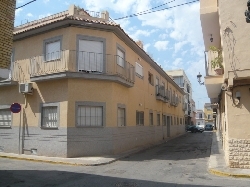 This is a comfortable and warm flat, well built and in a quiet neighbourhood, well connected with Valencia by underground. There is no garage, but there is usually no difficulty in parking near the building. In Spain we do not normally have kettles (we allways have at home an Italian style coffe-pot ), but we can provide you with a kettle on request (free of charge). We can provide with a cot in the flat (free of charge). 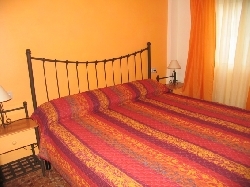 The cot has a mattress, mattress protector, bed linen, a cotton bedspread or a blanket depending on the season. Please ask us if you need it. Rafelbunyol is a town close to Valencia, 15 minutes to the north of Valencia via the AP-7 motorway. It is also well connected with the city by means of Line 3 (the red line) of the underground, and the underground station is only 400 meters from the flat, or 5 minutes on foot. The underground arrives at the centre of Valencia in about 30 minutes, without changing train. Rafelbunyol is also 10 minutes by car from the beach area of Puebla de Farnals (4-6 km) and El Puig (6 km). In summer, there is a bus to the Puebla de Farnals beach. 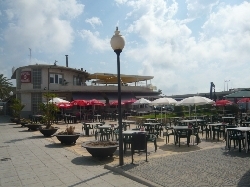 The town has a sports centre with covered swimming pool, and an open-air swimming pool with bar in summer and a big and new playground and gardens for children. Visit the Santa Mar�a de El Puig Monastery, National Historical Artistic Monument, whose construction dates from 1238. This is located just some 5 km from Rafelbunyol, in the very nice small town of El Puig. Visit also Sagunto (15 km) a town full of historic tradition. Here you will find ruins dating back to when the Romans ruled these lands. Obligatory visits here are the spectacular Castle, the Roman Theatre (every summer, the latter holds the "Sagunt a Escena" International Theatre Festival), the Jewish Quarter, The Acropolis and the Temple of Diana. 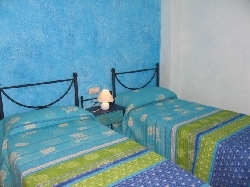 Stays longer than 3 months, please consult our special offers. These rates can change in special events such as Las Fallas, GP Formula 1, GP Cheste, fairs and other events, and the minimun stay can be longer at these times. Please check the availability and price. There are discounts for stays longer than a week and for children under 6 years old. Babies are free (There is no charge for babies). We also provide you with a free cot. Just ask us if you need it. We encourage you to consult us about your own requirements. We always try to personalice our service.